The U.N. human rights chief called on the United States on Friday to close down the Guantanamo prison camp, saying the indefinite imprisonment of many detainees without charge or trial violated international law. Navi Pillay said the hunger strike being staged by some inmates at the Guantanamo Bay U.S. Naval Base in southeastern Cuba was a "desperate act" but "scarcely surprising". "We must be clear about this: the United States is in clear breach not just of its own commitments but also of international laws and standards that it is obliged to uphold," the United Nations High Commissioner for Human Rights said in a statement. U.S. President Barack Obama pledged four years ago to close the controversial facility, opened by the Bush administration in January 2002 to hold men captured in counter-terrorism operations after the deadly September 11 attacks on America. Pillay voiced deep disappointment at the U.S. government's failure to close Guantanamo despite its repeated commitments, but welcomed comments by a White House spokesman last week reiterating the intention to do so while citing congressional legislation as the prime obstacle. About half of the current 166 detainees have been cleared for transfer either to home countries or third countries for resettlement, Pillay said. "As a first step, those who have been cleared for release must be released," she said. "FESTERING FOR MORE THAN A DECADE"
"Others reportedly have been designated for further indefinite detention. Some of them have been festering in this detention center for more than a decade," she said. Guantanamo detainees accused of crimes should be tried in civilian courts, especially as the military commissions "do not meet international fair trial standards" despite improvements since 2009, said Pillay, a former U.N. war crimes judge. Of the 166 remaining detainees, only nine have been charged or convicted of crimes, according to military records. The 166 detainees are from 23 countries, the Red Cross says. Forty inmates are currently staging a hunger strike to protest against their indefinite detention, according to a U.S. military spokesman at Guantanamo. Some have lost so much weight that they are being force-fed liquid nutrients through tubes inserted into their noses and down into their stomachs. The International Committee of the Red Cross has visited Guantanamo regularly since it opened to check on conditions of detention and ensure humane treatment. It is currently carrying out its 93rd visit, expected to last another week. The ICRC sent a doctor and another delegate to Guantanamo on March 25, a week earlier than planned because of concern about a growing hunger strike among detainees, the humanitarian agency said at the time. An ICRC team of 13 now there are discussing issues including the hunger strike separately with authorities and in private interviews with inmates, ICRC spokesman Alexis Heeb said. "Detainees can raise any problem they want to bring to our attention, this can be issues of detention, Koran issues, requests for medical attention," Heeb told Reuters on Friday, referring to media reports about searches of Korans for contraband. The ICRC has a clear position of being opposed to forced feeding or forced treatment and upholds the principle of leaving the right to detainees to choose his or her fate, he said. ICRC President Peter Maurer is expected to raise concerns about Guantanamo in talks next week with senior U.S. officials during his three-day visit to Washington, Heeb said. "We continue to hold detainees under the internationally recognized Law of War and in keeping with the best of our core values, safeguarding and humanely treating all who are in our care and custody, there. Assertions that present some alternate narrative simply do not withstand intellectual rigor," a U.S. Department of Defense spokesman, Lieutenant Colonel Todd Breasseale, told Reuters in response to Pillay's statement. Tory Minister Ken Clarke is this week accused of lying to parliament, with disinformation to confuse British legislators, a few days ahead of the Tory government's plan, to introduce secret courts, before a backdoor critical vote in the House of Lords, to rubber stamp internment, without a proper trial. Currently with the internment of veteran Irish republicans, Marian Price and Martin Corey, the British have been conducting once again experiments, with Irish guinea pigs and the resulting public reaction , once again, in the backwater police state laboratory, that is British Occupied Ireland. Human Rights Campaigners in London, claimed yesterday, that the Tory Minister gave false information, about whether the ancient writ of habeas corpus, will be destroyed by the justice and security bill. Yesterday's accusations against the Tory Minister, come on top of accusations, that the Tory Government since coming to power, have been trashing the Irish peace process. 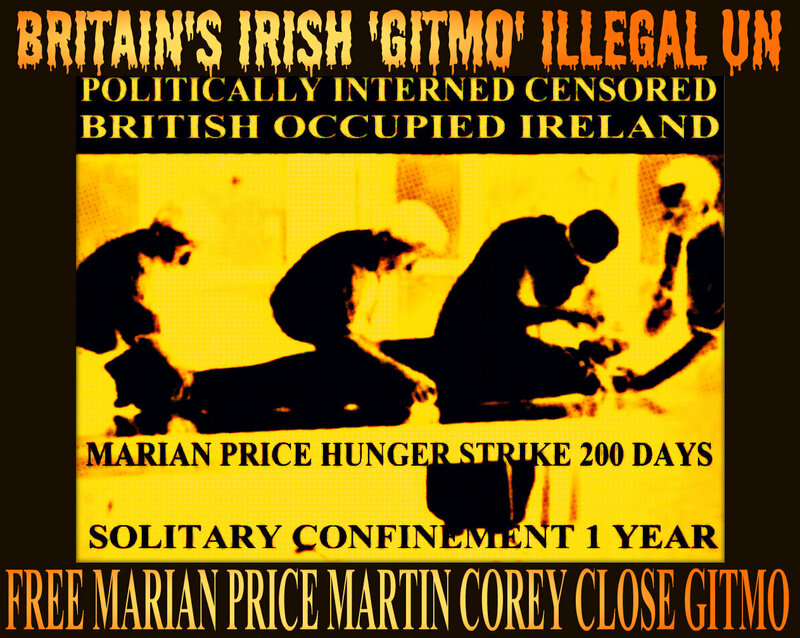 The reintroduction of Internment without trial In British Occupied Ireland, has confirmed for many Irish proponents of the peace process, the 800 year old pedigree of the invading beast, that is 'Perfidious Albion' in Ireland. Gerry Adams recently claimed that Tory British Prime Cameron, has stepped away from the peace process, since coming into power. (Diplomatic speak for reneging on the Agreement.) He said “Since the election of the Tory/Lib Dem coalition, the British prime minister, has detached himself, from the continuing promotion and development of the peace and political processes,” Adams also said, for anyone paying attention, that the UK government had refused to honour commitments in the Good Friday, Weston Park and St Andrew’s Agreements: that are all part of Irish Peace Process. Adams further mentioned, that the British are reneging on calls for inquiries, into several incidents, including the murder of lawyer Pat Finucane, the Dublin and Monaghan bombings, and the 1971 Ballymurphy Massacre, in which 11 people were killed by British security forces in Belfast. Habeas corpus used in Britain since 1305, is regarded as one of the fundamentals of human rights and is used by lawyers, to demand a prisoner be released immediately, from unlawful detention used as a basic safeguard of liberty, in democracies worldwide. Were secret courts, known as "closed material procedures" (CMPs), be allowed to the feudal Tories, human rights campaigners believe, many perfectly innocent people, particularly political prisoners like Marian Price and Martin Corey, will spend the rest of their lives interned, without a proper trial, without knowing why, because of secret evidence, charges and sentences being used against them, deemed too sensitive to allow challenge or public scrutiny. Just days before a bill that sanctions changes, expanding the use of secret hearings, into the mainstream judicial system, human rights lawyers say, the Tories are using disinformation on CMPs and habeas corpus claims, to confuse legislators and the public. With the new legislation and the privatization of the prison business, Tories and their friends, plan to create a highly lucrative billion pound business to intern indefinitely, cheap labour and any form of political dissent. Tory Minister Clarke, betrayed himself as a liar, by contradicting himself, when he stated earlier this month, that it would not impact habeas corpus, while later in the same session, he changed his reply, to reading out a note from a Government lawyer, which said the Tory government "can't envisage" a situation where habeas corpus, would conflict with secret courts. However the Tory Cabinet Office itself, has now confirmed, secret courts could be used in habeas corpus claims, in instances, where a "judge has found, that their use, would be in the interests of the fair and effective administration of justice." Lord Wallace, advocate general for Scotland, has confirmed to parliament, that this was a possibility and that a Home Office minister, had confirmed this just last month. Clarke was obviously on a mission to confuse, when he further told MPs that the issue of habeas corpus and closed material procedures, had "bowled me middle-stump" and that the government "ought to be allowed to go away and consider the matter." Essentially disinformation with a nod and a wink to legislators, compromised by the 'secret services'. Human rights campaigners say, that the Commons has still to be updated, even though the bill reaches its final stage within days. Clare Algar, director of Reprieve, said: "Ken Clarke has misled parliament over the impact of the secret courts bill. He told the Commons secret courts could not be used in cases where someone's liberty is at stake, yet now his own department has been forced to admit that this claim was wrong. Under the government's plans, it will be possible to use secret courts in habeas corpus claims – the ancient right we all have to demand that we are either given a trial or released from custody. This bill strikes at the heart of the principle that everyone has the right to a fair trial and that no one, not even the government, is above the law. Given the significance of these changes, it is disgraceful that we are seeing obfuscation and misinformation from ministers, even at this late stage.It is hard to see how anyone can now believe any of the reassurances given by the government on the secret courts bill. MPs and peers must do everything they can to stop these dangerous proposals from wrecking our justice system." While spokesperson for the Tory Cabinet Office says: "Habeas corpus cases involving national security evidence are extremely rare. Under the bill, a CMP could only be used in such a case where a judge has found, that their use would be in the interests of the fair and effective administration of justice. Even then they could only be used, to hear those pieces of evidence, which that same judge has found are security sensitive." Gareth Pierce who successfully liberated the Guilford Four and Birmingham Six, overturning previous political convictions, said, "In Britain, Blair bulldozed through parliament a new brand of internment claiming that Britain faced a similar emergency. This resulted in the arrest on 17 December 2001 of 12 foreign nationals living in Britain who were all sent to Belmarsh prison. These men have been locked up indefinitely without trial, never told the accusations against them, never questioned, never spoken to by the police, the detainee's lawyer not permitted to see the evidence against him. Nothing this bad happened during the Irish conflict." Gareth hasn't obviously heard of Long Kesh Concentration Camp, Marian Price or Marian Corey but then she is a busy woman and British censorship is pretty effective. Gareth Pierce argues, from the perspective of her considerable experience, that miscarriages of justice, such as internment without a proper trial, is in the context of the forty years of war conducted by the British in Occupied Ireland. "Central to the anger and despair that fuelled the conflict, was the realization, that the British courts, would offer neither protection nor justice.This should be always in our minds, as we analyse the experiences of our new suspect community. A constant theme with Gareth Pierce is that justice dies, when the law is co-opted for political purposes.While she says "Justice has been subverted many times in this country for political ends, that seems hard to credit." 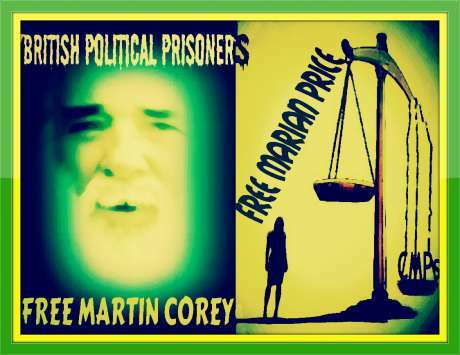 The Tories in trashing the Irish Peace Process, obviously have no qualms about subverting the course of justice, if the the political internment of Marian Price and Martin Corey are anything to go by.